The BIOLYFE project aims at improving critical steps of the second generation bioethanol production process and at demonstrating the whole supply chain, from feedstock sourcing via fuel production to product utilisation. The main result will be the construction of an efficient second generation industrial demonstration unit with an annual output of about 40.000 tons of lignocellulosic bioethanol. In this BIOLYFE newsletter issue, we would like to present some of the preliminary results produced during the first project period. As a first milestone, potential feedstocks for lignocellulosic ethanol production were evaluated and Arundo donax (in combination with agricultural residues such as wheat straw) was identified as the most suitable energy crop for the project. In addition, work on pre-treatment, hydrolysis and fermentation of selected feedstocks has started. In parallel, the construction of the industrial bioethanol production plant is being prepared. Preliminary designs of plant components have been elaborated and authorisation procedures for plant construction are in progress. The BIOLYFE project and some of the results reported here were also presented at the First International Conference on Lignocellulosic Ethanol in Copenhagen from 13-15 October 2010. BIOLYFE is one of the four large lignocellulosic ethanol demonstration projects funded by the 7th EU Research Framework Programme with total grants of € 35 million. The other three projects funded are KACELLE (Dong/Inbicon, Denmark), LED (Abengoa, Spain), and FibreEtOH (UPM-Kymmene, Finland). Other major issues discussed during the conference were the further development of biomass pre-treatment technologies, increasing the performance of enzymes and yeasts for hydrolysis and fermentation, the economics and sustainability of lignocellulosic ethanol, as well as the development towards multi-product biorefineries. The BIOLYFE project aims at demonstrating the production of lignocellulosic ethanol from dedicated energy crops at industrial scale. In order to achieve both economic and environmental feasibility of the overall process, project activities include the evaluation of potential feedstock crops and agricultural residues, as well as the selection of the most suitable feedstock by the BIOLYFE partner Agriconsulting. Considering the framework conditions found in the target region, as well as general agronomic, logistic, environmental and economic aspects, the feedstock for the BIOLYFE process was selected among the following candidate species: Fibre Sorghum (Sorghum sp. hybrids with high cellulose contents), Miscanthus grass (Miscanthus x giganteus hybrid), Giant Reed (Arundo donax), and Switchgrass (Panicum virgatum). The BIOLYFE plant for the production of lignocellulosic ethanol will be located in Crescentino in Northern Italy, between Turin and Milan. It was decided to source the necessary feedstock (around 170.000 tons of dry biomass per year) from a radius of 70 km around the production plant. The area is characterised by the production of intensive crops (grains such as wheat, barley and maize) and rice. While grain cultivation in the area suffers from very low gross profit margins, rice is, at the moment, heavily subsidized and provides good profits to farmers. However, rice subsidies are under examination and might be reduced in the near future. Therefore, diversification with other crops (i.e. energy crops for ethanol production) is an attractive option for grain producers in the region and might also become an option for rice producing farmers. Considering these factors, the chosen area and radius are sufficient to produce the biomass needed for lignocellulosic ethanol production in the BIOLYFE plant. 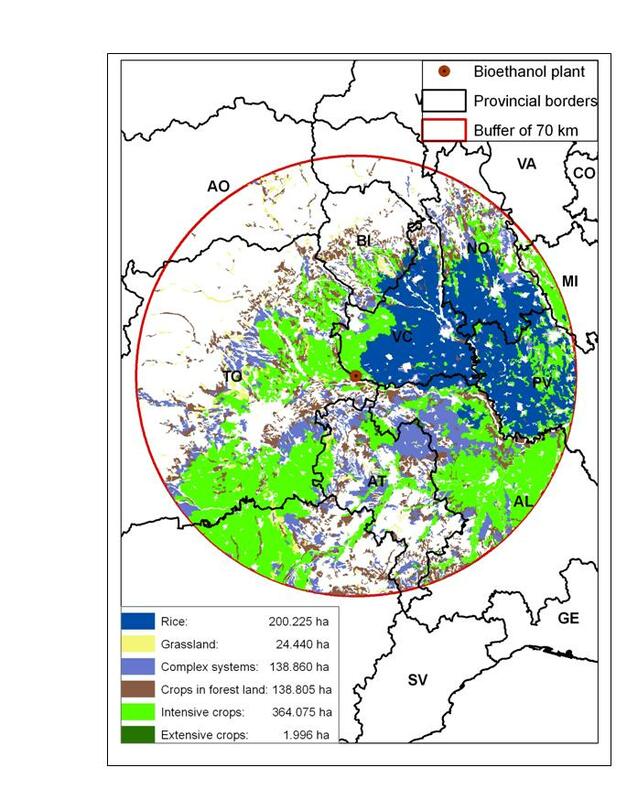 Even if only grain cultivation area is considered and if only a modest productivity of 20 tons of dry biomass per hectare and year is taken into account (30 tons per hectare are expected), it would be sufficient to use less than 2.5 % of the grain cultivation area for energy crop production. A first evaluation of selected crops identified specific disadvantages of two species: Switchgrass shows the lowest yields of the considered crops and its potential to infest conventional crops in surrounding areas makes it unattractive for farmers in the region. Miscanthus shows very good productivities but its sensitivity against temperatures below −3°C constitutes a high risk under the climatic circumstances in the target area. For these reasons, and also considering preliminary experiments with the utilisation of these crops, Switchgrass and Miscanthus were not considered in the further evaluation. As a next step, production costs for the remaining crops, Sorghum and Arundo, were estimated. Sorghum, as an annual crop, needs more soil preparation, a higher chemical and energy input and also harvesting costs are higher as compared to Arundo. In addition, harvesting and storage for Sorghum would need further optimisation. Sorghum production costs per hectare and year are estimated to be above EUR 1000 and double that of Arundo. Furthermore, Sorghum only delivers high productivity under optimum weather conditions and is highly dependent on factors such as sufficient water availability. As a result of this evaluation, Arundo represents the first choice feedstock crop for the BIOLYFE project. Besides low production costs, Arundo can be harvested all year long which further simplifies biomass logistics. However, factors such as yield and moisture content will vary over the year which has to be considered in planning ethanol production. In order to be an attractive option for farmers in the region, Arundo should provide a gross profit margin of EUR 300-400 per hectare which could result in a price per ton of dry biomass (unprocessed) between EUR 25 and 30 at the ethanol plant. In summary, the BIOLYFE project will use Arundo donax as the main feedstock for the production of lignocellulosic ethanol, while Sorghum (and also local straw residues from grain cultivation) can be used to diversify feedstock supply. The BIOLYFE partners Chemtex and ENEA characterised a large number of Arundo ecotypes and Sorghum hybrids. In order to identify the most suitable varieties, basic parameters such as moisture, sugar, lignin and ash contents were measured following standard protocols. The most suitable varieties were tested by Chemtex in its proprietary two-step steam pre-treatment process (continuous unit with 40 kg of dry biomass per hour) and pre-treated materials were chemically characterised. After optimisation of the process to selected biomasses, pre-treated material was delivered to partners for further testing. In order to verify the efficiency of the Chemtex pre-treatment process, ENEA applied one-step steam pre-treatment, as well as acid catalysed steam pre-treatment to the same raw biomass materials. The effect of different pre-treatment processes was compared in subsequent hydrolysis tests. For the enzymatic hydrolysis step, project partner Novozymes delivered the enzyme products “Cellic Ctec” and “Cellic Htec” as a benchmark material to the partners. In the meantime, Novozymes has developed an advanced enzyme product called “Cellic Ctec2” which has now been delivered to the partners and will be used in future experiments. The hydrolysis tests with pre-treated materials showed that the Chemtex steam pre-treatment process effectively defiberizes biomass, giving almost theoretical hydrolysis yields (with Novozymes products). The fine tuning of the enzymes dosage and the optimization of operating conditions is currently in progress. Another approach towards hydrolysis was the development of a high solid viscosity reduction (pre-hydrolysis) step by Chemtex. A continuous reactor was designed and setup at bench scale (20 kg per hour), which can be easily upscaled. The system was tested with Novozymes products and showed dramatic viscosity reduction already after 2.5 hours, even with high dry solid contents of above 40 %. Patent applications for the technology have been filed and reactor design for the demonstration scale has been completed. Regarding the subsequent co-fermentation of sugars to ethanol and the development of a simultaneous saccharification and fermentation (SSF) process, project partner Lund University tested the co-fermenting yeast strain TMB3400 which was provided by Taurus Energy. TMB3400 showed better robustness against inhibitors produced during biomass pre-treatment, as compared to the reference yeast strain USM21. Materials pre-treated by Chemtex were tested in lab scale SSF reactors (in combination with Novozymes products at different enzyme loadings), without applying a previous hydrolysis step. It was shown that the pre-treated materials provided by Chemtex had very low inhibitory effects on the process, mainly due to low furfural and HMF contents in the medium. Furthermore, the experiments showed that, without a pre-hydrolysis step, hydrolysis of the materials remains incomplete. The fermentation of the available sugars (both glucose and xylose) on the other hand was complete in SSF, using TMB3400 on pre-treated biomass. Using these results, Chemtex elaborated a basic design for the SSF reactor at demonstration scale. The preliminary design of the complete demonstration plant, as well as the permission procedure for plant construction has started.